(CNN) - Mitt Romney's campaign released a new Web video Sunday, forging ahead in its attacks over the president's assertion last week that the private sector was "doing fine." The spot features President Barack Obama's remarks, followed by a series of dramatic, black-and-white interviews with laid-off Americans talking about their economic struggles. "When it's all said and done, I'm making $200 a month," one man says in the video. "I had to file my own personal bankruptcy and had to close my business," another man says. Obama made the remarks Friday during a press conference, arguing the private sector was doing better than the public sector. "The truth of the matter is that, as I said, we created 4.3 million jobs over the last two, 27 months, over 800,000 just this year alone. The private sector's doing fine," Obama said. "Where we're seeing weaknesses in our economy (has) to do with state and local government, oftentimes cuts initiated by, you know, governors or mayors who are not getting the kind of help that they have in the past from the federal government and who don't have the same flexibility as the federal government in dealing with fewer revenues coming in." 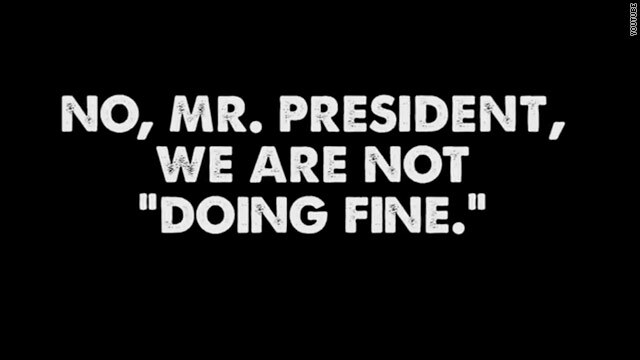 However, the Romney video only displays the lines: "The private sector's doing fine" and "Where we're seeing weaknesses in our economy (has) to do with state and local government." The former line is repeated four times in the spot. The ad ends with text on the screen: "No, Mr. President. We are not 'doing fine.' "
Later Friday, Obama walked back his assertion, saying the "economy is not doing fine." His campaign has insisted the president's words were being misread, and he was merely talking in relative terms. Romney responded to the remarks that same day, saying the president wants to stimulate the public sector over the private sector. "(Obama) wants another stimulus; he wants to hire more government workers. He says we need more firemen, more policemen, more teachers," Romney said at a press conference in Utah. "Did he not get the message of Wisconsin? The American people did. It's time for us to cut back on government and help the American people." In what has since become a spiraling fight between the two campaigns, the Obama team quickly pounced on those statements and released a web video Saturday attacking Romney as being against firefighters, police and teachers. On CNN's "State of the Union" on Sunday, the president's senior campaign adviser, David Axelrod, argued that Romney and Republicans were "more eager to have a debate over an out-of-context clause" than the "substance of what (Obama) says." Who would you rather have in the White House?... Someone who spends most of their time being a "Celebrity" and watching NCAA Basketball Games? Or someone who actually cares about the Country and will get it back on the right track through Job Creation and Strong Leadership? Hmm... thats a hard one. I guess since we live in a Society of "Celebrities" it makes sense why people can be blinded by True Leadership. $250 million, and Mittens is not doing fine. The Kochs netted $26 billion in profits last year, and they are struggling to come up with a billion dollars to help Mittens. Big oil makes record profits, and they are struggling as well. Yet Mittens is not worried about the poor. As usual, Romney offers no alternative PLAN, only attacks. If Mittens would call the republican young gnus and wildebeests in congress and tell them to pass the bipartisan transportation bill, unemployment will drop 1%. If Mittens thinks this is bad, he should have been around during the Bush republican near depression and deep recession. That was ugly. My parents survived the first great republican depression, and having survived the Bush republican near depression, I am confident that Mittens will finish off the job. After all, republicans, Taliban, and foreign and domestic terrorists are hoping to see our country go down. If they aren't doing fine.....then what has Rich Money and the so-called "job creators" been doing their 10+years of tax savings?????? And Rich Money's plan is to cut MORE taxes for the 1% who admit that they FAILED their duties to create jobs?????? Romney has been running around denounceing Obama but he hasn't said what he intends to do for the people of this country.He says he's going to eleminate this an that an defund plan parenthood get rid of Obama care and lower taxes for corporations ect but really not a thing for the middle class or the poor.Oh ! thats right the poor he doesn't worry about they have a safty net ! LOL Mitt Romney is only concerned about himelf his Mormon faith and his Wallstreet buddies period.I forgot, he did say he is going to turn Education over to Wallstreet to control.I will NEVER vote for anybody like that ever. Romney sounds more like a "parakee" than a politician repeating everything Obama says now Romney's got my "parakee" repeating everything he says. So what's your plan Mitt? Oh I forgot you dont have one. Black and white ads are so 1950's. Give us a plan Romney and stop waiting to build your campaign on every word President Obama says. I am so sick and fed up with the gotcha ads. Let us know who you are Romney and what your plans are. We are tried of the frat boy and CEO games. Obama is right, he had taken the financial sector from the second lowest in history, to its highest this country have ever seen, these folks have nearly three trillion dollars on their books for crying out loud, that's more money than nearly three of the world GDP. all these repubs does is use nonsensical messages to woo the gullible and never talk about the real issue, which is jobs, this president cannot force businesses to hire no onek, or else they will stick their repubs attack dogs shouting. government over reach. and free enterprise to take American jobs to China, for slave labor. for suckers just like bush played them not once but twice. We would be doing fine now if the repugs had been participating in our recovery instead of doing everything they could to scuttle it to make Obama look bad. repug business leaders, the 'job creators,' are sitting on trillions of dollars instead of putting people back to work so the unemployment no.s will stay high in hopes of unseating a president they hate. so much for repug patriotism! they love their country, so they say, but not enough to put their hatred of this president aside and work to fix the mess they made. traitors!!! i'm praying the American people aren't stupid enough to fall for this horrendous tactic.